Despite the weekend being too short (as always) and it being Monday again, I hoped you've all had a great weekend. I spent mine catching up with friends I haven't seen in a while over good food and fabulous conversation. I even managed to squeeze a day trip to Daylesford with some of those friends on Sunday for some hiking and photography. We love country towns for their relaxed atmosphere and friendly locals - for us, it's a temporary but welcomed escape from the craziness of the urban lifestyle we lead. 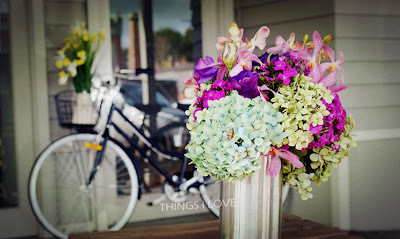 Whilst in Daylesford, we came across a table of beautiful floral arrangements and a bicycle leaning against a store front and I just couldn't resist going happy snappy and have a pretty photo to share below. Congratulations to these lucky ladies who will have their amazing MUK haircare prizes sent to them in the coming week. I hope you enjoy your prizes and will share with us your thoughts on them in the near future on the MUK or Things I Love Facebook page. This week will be a hectic one for me at work so blog posts might be short and infrequent. I still haven't had the chance to draw my birthday giveaway winners yet but will be doing so in the coming days so stay tuned for more winner announcements. Till then, have a fab week! I still cant believe I WON!!! =) I got my MUK hair products today!!!! I can't wait to show everyone!! I'm so excited!!! Can't wait to delve into it. Thanks sooooooooooooo much for the competition!!!! Its awesome!! !